• Attorney General William P. Barr has said a summary of the Mueller report’s “principal conclusions” could be ready as soon as Sunday. • House Democrats vowed to press ahead with their inquiries whether or not the special counsel’s report accuses the president of wrongdoing. Barr and his aides are preparing a version of the report to send to Congress. Mr. Barr arrived at the Justice Department on Sunday morning at around 10 a.m. He quickly got to work with the deputy attorney general, Rod J. Rosenstein, and the department’s congressional liaison, Stephen E. Boyd, to finalize the letter to Congress that would list the top-line findings of the special counsel, Robert S. Mueller III. Mr. Barr’s chief of staff brought doughnuts to the reporters in the press room. At midday, Mr. Boyd brought a bag of sandwiches back to the building, an indication that none of the officials would be leaving soon. Reporters fielded texts and calls from current and former Justice Department employees who also wanted to know what to expect. The president will return to Washington early in the evening. Amid a weekend of golf and meals with family, Mr. Trump radiated an air of calm, according to people with him at Mar-a-Lago. Some of his aides stressed caution as they awaited the details of the Mueller report. But in private conversations, Mr. Trump expressed concern about what night be in it, people close to him said. He emphasized that he believed there was a “coup” attempt by federal investigators. He is scheduled to return to the White House at 6:45 p.m.
Mr. Trump golf partners at his Florida course on Sunday were Senator Lindsey Graham; Trey Gowdy, the former representative; and Mick Mulvaney, the acting White House chief of staff. All three men are from South Carolina. 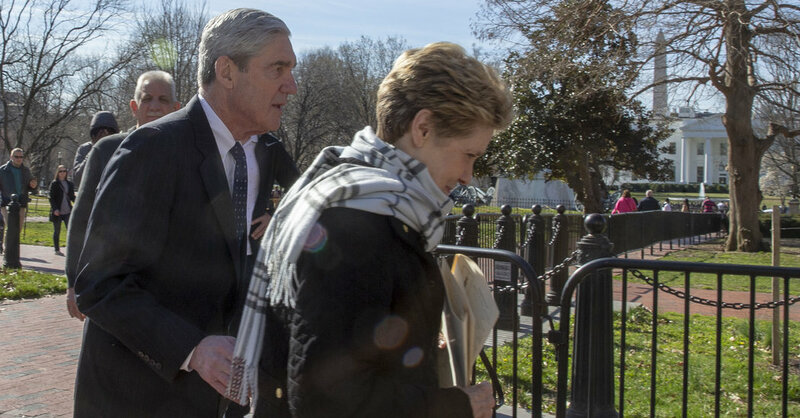 Robert Mueller makes a rare public appearance. The soon-to-be-former special counsel attended services at St. John’s Episcopal Church across Lafayette Park from White House on Sunday morning. Read into that what you like. The spinning began before there was anything to spin. They have not yet seen any of Mr. Mueller’s findings, but congressional lawmakers from both parties spent Sunday morning trying to shape expectations about what was coming. Top House Democrats insisted that their own investigations must go on regardless of whether the Justice Department accuses Mr. Trump of wrongdoing. And they said they were ready to go as far as the Supreme Court if needed to get access to Mr. Mueller’s full findings — not just what Mr. Barr shares. Republicans, meanwhile, were eager to portray Democrats as already disappointed by the mystery report and poised to overreach their authority in a desperate effort to damage Mr. Trump. “Let’s be honest with the facts and say probably what the facts show is there was no collusion,” Representative Doug Collins of Georgia, Mr. Nadler’s Republican counterpart on the Judiciary Committee, said on Fox.